There are six pillars or columns inside the Rawdah area within Masjid Nabawi that hold special historical and spiritual significance, with a further two inside the Sacred Chamber. These blessed pillars stand on the exact locations where the original pillars, made from palm-tree trunks, stood after Masjid Nabawi was built during the life of the Prophet ﷺ. From that time until present day, those who extended, rebuilt or extended the mosque were very scrupulous in preserving the original location of these pillars. These sacred pillars are distinct from the other pillars inside the present construction of Masjid Nabawi in that their positioning is irregular in relation to the consistent layout of the other columns. Three of the pillars are incorporated within the golden railing surrounding the Sacred Chamber on the side where visitors normally greet the Prophet ﷺ and his companions, one is to the rear of the mihrab, and the other two stand in the first row of pillars closest to the mihrab in the Rawdah area. The name of each pillar is marked by a gold Arabic inscription on a large green circle, encircled by a golden wreathe. The pillars as you see them today were erected during the Ottoman era. I saw the most famous amongst the companions of the Prophet ﷺ hurrying towards the pillars at the Maghrib prayer before the Prophet ﷺ came for the prayer. The Arabic word commonly used for these pillars is Ustuwanah (Arabic: اسطوانة), which is derived from the Persian word Sutun (Persian: ستون). This specifically refers to a pillar that has the same circumference throughout the length of its body, from the top to its base. Each pillar also has one or two names describing what it’s famous for. A woman asked, ‘O Messenger of Allah ﷺ! Should I build something for you to sit on? I have a slave who is a carpenter.’ He replied, ‘Yes, if you like.’ So she had that pulpit constructed. When it was Friday, the Prophet ﷺ sat on that pulpit. 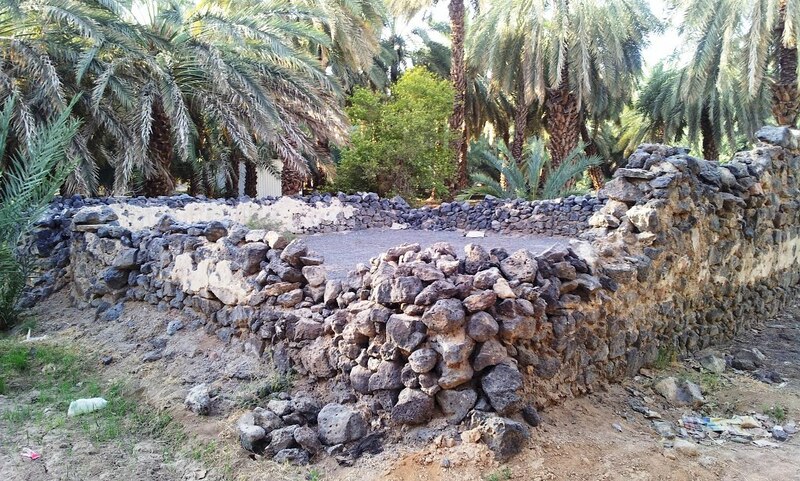 The date-palm trunk near which the Prophet ﷺ used to deliver his sermons cried so much so that it was about to burst. Choose if you want me to plant you in the place you were in, and you will be as you were before, or if you want, I can plant you in Paradise and you can drink from its rivers and springs, and your growth will be good; you will bear fruit and the friends of Allah will eat from your fruit. The word “hannana” (Arabic: حنانة) refers to a weeping camel. It was thus named Ustuwanah al-Hannana because the crying of the tree trunk resembled weeping in this manner. During an expansions of Masjid Nabawi, most likely during the caliphate of Uthman ibn Affan I, the palm-trunk was taken by the companion Ubai ibn Ka’b al-Ansari I and stored in his house. There it unfortunately withered and was eaten by termites until it turned into dust. The pillar is also known as the Perfumed Pillar (Ustuwanah al-Mukhallaqah; اسطوانة المخلقة) on account of perfume being applied to the pillar. The word “mukhallaqah” (Arabic: مخلقة) is derived from the word “khaluq” which is a type of musk (a woman’s perfume mixed with saffron and is red and yellow in colour). This perfume used to be applied to the tree trunk, hence its name. Once the blessed Prophet ﷺ was leading the prayer and saw spittle on the qibla wall. After completing his prayer, he said: “When anyone of you prays, he is conversing quietly with his Lord, and Allah is in front of him. So, none of you should spit toward the qibla or to his right.” He then requested a stick and scraped it off, before calling for khaluq and applying it (Narrated by Ahmad, Ibn Abi Shaiba, Abd al-Razzaq). When al-Khayzuran bint Atta V, the mother of the Abbasid caliph Harun al-Rashid V mother, came for pilgrimage in 170 AH, she would apply perfume to all the pillars, but would apply more on this one, the Pillar of Aisha, and the pillar west of the mihrab. All three of these pillars were sometimes referred to as “perfumed”, but eventually, the title was only attributed to this particular pillar. The special virtue of this pillar is that the Prophet ﷺ stood there to lead prayers for some time before establishing a location for prayer not far from where the mihrab now stands (Narrated by Ali al-Samhudi in Wafa al-Wafa). According to Imam Malik I, this is the best location to pray salah in Masjid Nabawi. It is for this reason a mihrab, known as Mihrab al-Nabi, was built in this location. This prayer niche was not present during the time of the Prophet ﷺ or the Rightly Guided Caliphs, but was built by Umar ibn Abdul Aziz I during the caliphate of Walid ibn Abdul Malik I when he was governor of Madinah. The Pillar of Repentance (Ustuwanah al-Tawbah; اسطوانة التوبة), also known as the Pillar of Abu Lubabah (Ustuwana Abu Lubabah; اسطوانة ابو لبابة) is located next to the Pillar of the Bed, in the first row of pillars of the Rawdah closest to Mihrab al-Nabi. It is the fourth pillar from the minbar as you approach the Sacred Chamber. The colour of marble used on this row is different from the rest of the pillars in the Rawdah. It was so called after a famous incident involving the venerable companion Abu Lubabah ibn Abd al-Mundhir I during the Siege of the Banu Qurayza in 5 AH following the Battle of the Trench. Abu Lubabah, who was from the Banu Aws, had close ties to the Banu Qurayza, a Jewish tribe from Madinah which had betrayed the Muslims after being allied to them. For their treachery, the Prophet ﷺ and his army laid siege to the fortress of Banu Qurayza for 25 days. After resigning themselves to defeat, they sent a message to the Prophet ﷺ asking him to send Abu Lubabah I to them so that they might consult him about their situation. With the permission of the Prophet ﷺ, Abu Lubabah I entered the fortress and spoke with them. They asked his advice as to whether they should surrender and submit to the judgment of the Prophet ﷺ, to which he answered affirmatively but ran his finger across his throat, indicating that they would be executed. With this gesture, he confirmed what they already knew – that they were to be sentenced to death for treason. No sooner had he said this that he felt he had betrayed the Prophet ﷺ for revealing his plan. He later said: “I had not even moved from my spot that it dawned on me that I had betrayed Allah and His Messenger ﷺ”. It is recommended for visitors to Masjid Nabawi to stand before or near the pillar and ask for God’s forgiveness. The Pillar of Aisha (Ustuwanat Aisha; اسطوانة السيدة عائشة), also known as the Pillar of Casting Lots (Ustuwanah al-Qur’ah; اسطوانة القٌرعة) is located next to the Pillar of Repentance, in the first row of pillars closest to Mihrab al-Nabi. It is the third pillar from the minbar as you approach the Sacred Chamber. It got its name after Aisha J revealed the virtue of prayer in that area. The pillar is also known as the Pillar of the Emigrants (Ustuwanah al-Muhajireen; اسطوانة المهاجرين) because the emigrants from Makkah would regularly sit in this area. Furthermore, it is said that after the Prophet ﷺ arrived in Madinah, he led the prayer facing Bayt al-Maqdis (Jerusalem) from this location for 16-17 months. After the Qibla was changed, the Prophet ﷺ led the people in prayer from this spot for ten more days, before he designated his Mihrab to lead salah. 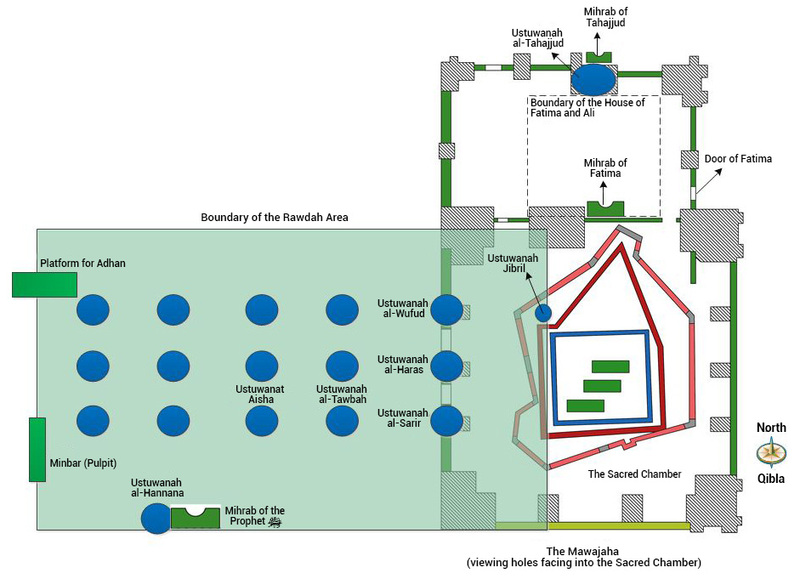 The Pillar of Delegations (Ustuwanah al-Wufud; اسطوانة الوفود) is the northernmost pillar of the three incorporated within the railing encompassing the Sacred Chamber. Between it and the Pillar of the Guard, there is a door that is in roughly the same location as the door the Prophet ﷺ would use to sometimes enter the mosque. Indeed, those who call you, [O Muhammad], from behind the chambers – most of them do not use reason. This revelation was an admonishment of those who would call out to the Prophet ﷺ somewhat crudely from behind the houses that belonged to the wives of the Prophet ﷺ. The Prophet ﷺ was vigilant one night and when he reached Medina, he said, ‘I wish that a pious man from my companions guard me tonight!’ Suddenly we heard the clatter of arms. He said, ‘Who is it?’ He replied, ” I am Sa’d ibn Abi Waqqas and have come to guard you.” So, the Prophet ﷺ slept (that night). The Pillar of the Bed (Ustuwanah al-Sarir; اسطوانة السرير) is the southernmost of the three pillars incorporated in the railing surrounding the Sacred Chamber, closest to the Qibla. The pillar marks the location where the Prophet ﷺ slept during I’tikaf (retreat) in the last ten days of Ramadan. His bed was made of palm fronds and his cushion was made of leather and stuffed with palm fibre. The Prophet ﷺ performed I’tikaf during the last 10 days of Ramadan each year after migration, with the exception of one year. The Square Pillar of the Tomb (Ustuwanah Murb’a al-Qabr; اسطوانة مربعة القبر) stands inside the Tomb of the Prophet ﷺ, behind its exterior wall, and cannot be seen from the outside. It is in line with the Pillar of Delegations. It was erected in later years to mark the door of Fatima’s house, which was accessed from the alleyway between the houses of Fatima and Aisha K. The Prophet ﷺ used this door to visit Fatima and her husband, Ali ibn Abi Talib L.
It is also known as the Pillar of Jibril (Ustuwanah Jibril; اسطوانة جبريل) because it is said that when Jibril S would come to the Prophet ﷺ with revelation, he would be seen sitting in this place, having adopted the appearance of the companion Dihyah Al-Kalbi I. The Pillar of the Night Prayer (Ustuwanah al-Tahajjud; اسطوانة التهجد) is situated behind the house of Fatima and Ali L, next to Niche of the Night Prayer (Mihrab al-Tahajjud;التهجد محراب‎) inside the Sacred Chamber. The Mihrab is built into the back wall of the chamber. 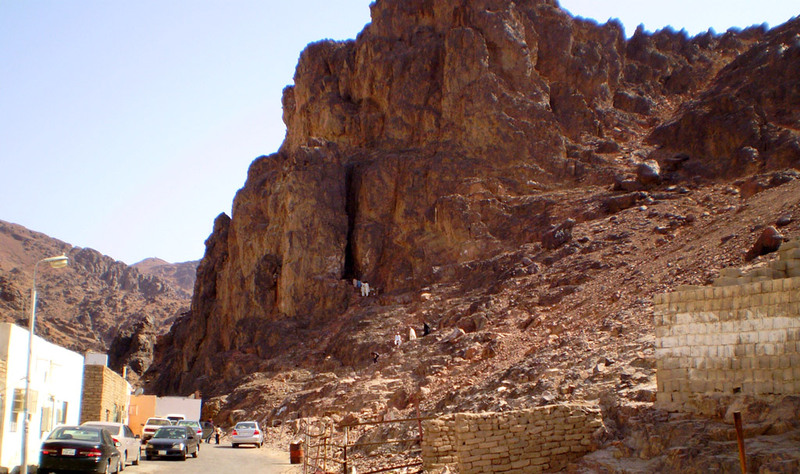 The Cave of Mount Uhud (Arabic: غار جبل احد) is the location where the Prophet ﷺ and some of his companions retreated to during the Battle of Uhud.